Topanga Canyon retreat? Stinson Beach surf shack? 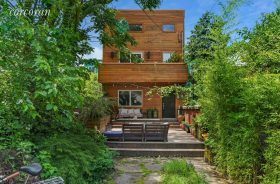 If you guessed either you’d be wrong, but this fully-detached single-family home at 71 Dikeman Street in Red Hook, asking $2.5 million, definitely has a California bohemian vibe that’s perfect for the laid-back waterfront neighborhood. In addition to a well-executed renovation, the two-story house has a 50-foot landscaped garden with an outdoor kitchen that’s the picture of summer leisure living.